Artists’ pigments are a source of information for understanding and safeguarding art objects. They are key elements in dating paintings and painted objects, attributing them to artists, and detecting fakes and forgeries. Their chemical identification is also crucial for finding safe conservation treatments and environmental conditions for display, storage, and transport of valuable art. Modern synthetic organic pigments and paint formulations are rife with problems — aging, cracking, fading — that are different from those of traditional painting materials. Therefore, it is vitally important that these modern pigments, along with their synthetic binders and additives, are characterized before problems arise. 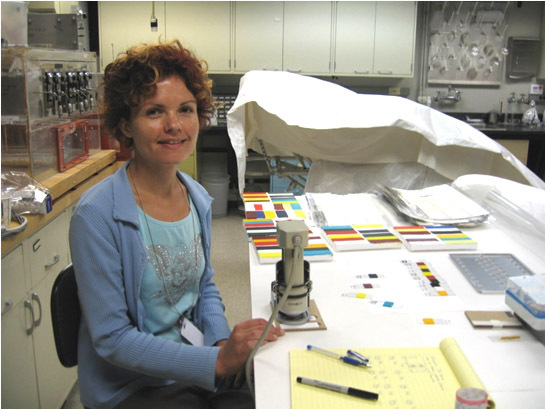 The Smithsonian’s Museum Conservation Institute scientists and fellows, in collaboration with international colleagues, have developed complementary analytical methods using X-ray diffraction and Raman spectroscopy that together allow improved identification of these modern synthetic organic pigments in acrylic and alkyd paint formulations and oil media, respectively. Raman spectroscopy, as a non-invasive and portable technique, allows the analysis to come to the painting. This research will be reported in an upcoming issue of the journal Analytical Chemistry.